The dynamic music of SWING MACHINE with David Westphalen ranges from big band dance favorites of the Swing Era, to jazz from classic to bebop, mainstream to bossa nova to pop-jazz, to Rock 'n Roll classics from the 50's and 60's, to Motown hits. SWING MACHINE is based in the Upper Valley of Vermont and New Hampshire, including Woodstock and Quechee, Vermont, and Lebanon and Hanover, New Hampshire. 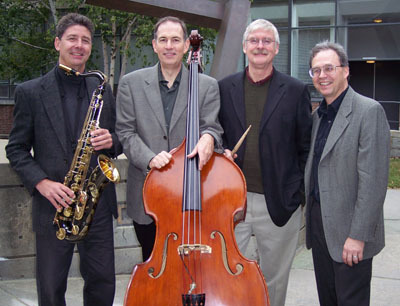 Depending on the occasion, the group varies from three to nine pieces, all experienced and talented mature musicians. SWING MACHINE is in demand for many engagements, including concerts, wedding receptions, dances, formal balls, college functions, private parties and community events. Their mix of instrumentals and vocals in many different tempos and styles is designed to please all ages. When SWING MACHINE plays, people truly enjoy their tremendous range of music... relaxing or snuggling to a beautiful ballad... and joining the crowd dancing to one of their contagious rhythms. David Westphalen can also be seen at Upper Valley venues such as Elixir and The Canoe Club. Come join David for one of these local jazz gigs! © David Westphalen 2003-8. All rights reserved. Last Updated 10 August 2008. | Site created by Elizabeth.